How to look taller if you have short legs. I was surprised when my daughter commented, “Mom, how come I didn’t get your long legs? I had always thought of how lucky she was to have a nicely proportioned hourglass body shape while I have a high hip-bone to deal with! We don’t always appreciate that each of us is designed uniquely. There is no one else like us in the world so we have the joy of dressing a unique work of art. There is a way to camouflage those traits that aren’t our favorites so let’s look at leg length. Change bootie to pump with hose that blend with colors. It is the lower part of your leg from your knee down that gives a visual appearance of a long leg. Thus, a skirt length near the knee is a good length for most people. Avoid wearing shoes that visually “cut” your lower leg such as ankle-strap shoes or short boots. You can achieve the look of a long leg line by wearing opaque tights in the same color as your booties and skirt. Wearing hose that visually pull your skirt and shoes together is also effective. A pointed toed shoe will further enhance the visual leg length. Wide legged cropped pants should be avoided. These trousers are great for the lady with wide hips but they should be full length, almost touching the floor. Monochromatic blend of colors pull this together. Notice how short her legs look with these wide-legged pants. One final trick for anyone who wants to appear to have longer legs, push your sleeves up! It is amazing how you instantly appear taller! How easy is that? Use these tricks and see how effective they are in helping you achieve the image you want. Author Beryl PleasantsPosted on January 26, 2018 January 26, 2018 Categories Image, Style, UncategorizedLeave a comment on Short legs? Was This Designed for Another Body? Yikes! This outfit is made for someone else’s body! You have this great new outfit. Then you notice that it doesn’t look quite like it did in the dressing room! Fit! It can make or break your image. In reality, few people can walk out of a store with a new garment and have the perfect fit. Each of our bodies is unique. None of us has the perfect proportions to match those used by a designer. Each brand of clothing uses its own design specs which explains why one brand will fit you beautifully and another will not even be wearable. You may have chosen a beautiful garment well styled for you but it doesn’t look great on you. It is probably fit. This is when you check with the alterations person and see if it can be adjusted to fit well and if the alteration are cost effective. Some of the most common fit issues are:Too tight–Too loose in certain areas–Sleeves too long or short–Sleeves are too tight or too loose–Pants have pull lines, especially in the crotch area–Proportion is not flattering to your build. Notice how much better the right image on the bottom looks with some fine tuning. This suit does not fit! The shoulders appear to be too wide and the sleeves are too short. Obviously, the skirt on the left is too tight. And we haven’t even seen the front! This looks more like a bath robe than a dress. It is too blousy and makes the wearer appear pounds heavier. I would suggest something more tailored to give her a stronger, trim looking vertical line. These pants pull in the rear. The rise is too short. This cannot be altered to fit properly so take care in choosing jeans and trousers that fit your rise. Author Beryl PleasantsPosted on October 10, 2017 November 3, 2017 Categories Image, Style, Uncategorized, WardrobeLeave a comment on Was This Designed for Another Body? looked more like a magazine for lumberjacks to choose their wardrobes to transition into cooler weather! The lumberjack look has a place–think hunting, cutting trees and many hardy outdoor activities. Fashion for every day is a bit of a stretch. Plaids give an outdoor image. The larger the plaid, the more masculine it looks. Plaids work very well for the person with a square jaw when appropriately sized to your features but they are not flattering for rounded features. Most of the garments that I noticed would have been appropriate for a Bohemian look but not serious daily wear. I can’t imagine wearing these selections to work unless you work in a very casual setting. There were a number of various sized check as well. I mean like one often sees in an Italian restaurant in red. Do you want to look like the tablecloth in a pizza restaurant? Even if the check is black and white, it still reminds you of a tablecloth! Carolina Herrera, known for her beautiful refined, feminine clothing, featured an evening dress in about a 1″ black and white check. Wouldn’t you feel more appropriate at a picnic? You will be happy to know that there are many other choices to help you choose the right look for you. 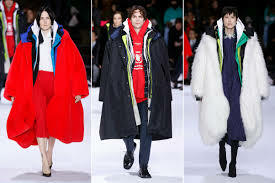 Wisely, the buyers for the stores chose more wearable pieces that do not represent the extreme choices of Vogue. Lets here it for the buyers! Author Beryl PleasantsPosted on September 29, 2017 September 29, 2017 Categories Image, Shopping, Style, UncategorizedLeave a comment on It’s Officially Fall! “Mirror, mirror, on the wall. I’m Ugly! What ever happened between these little girls who see their own beauty in the mirror but grow up to find every perceived flaw? I find that women have a much greater tendency than men to be self-deprecating. When they look in the mirror, they see just the things they don’t like and dismiss their natural beauty. One of the things I love the most about being an image consultant is helping women discover their personal beauty and learn how to make it work for them. After all, each of us has totally unique finger-prints and irises, then without question, each of us is a unique creation, never intended to look like someone else. Little girls look in the mirror and appreciate their image. Look at the sheer delight in the face of this little girl. 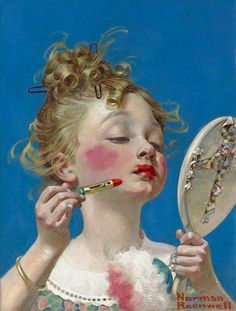 I have always love the Norman Rockwell picture of a young girl all dressed up admiring herself in her make-believe world. How do we lose that? It may be from some thoughtless critical remarks. It often comes when young girls start to compare themselves with others. It always saddens me when I see Cher today. She was strikingly beautiful with her dramatic bone structure. Her American Indian heritage was evident, giving her a unique beauty, unlike anyone else. In my opinion, she has diminished her unusual beauty by trying to look like everyone else. The key is to accept the “is’s”! So you wish you were tall enough to be a model and you are 5′ 2″. That’s and “is” and can’t be changed. Learn how to appreciate your petite frame and make the most of it. You can wear things that no 5′ 10″ woman can wear! Or perhaps you are large boned. You aren’t going to be able to wear something frilly and very feminine. 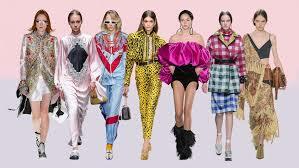 You will probably look fabulous in more tailored, classic or sporty clothes. 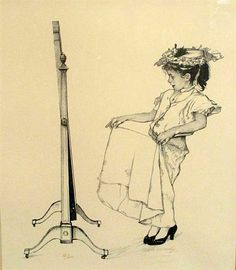 Norman Rockwell was a master at capturing emotions of children. This little girl is totally delighted in the result of adding make-up. I encourage everyone to stop and look at your own beautiful design. Treasure those aspects that are your unique beauty. Do you get compliments on your hair? Then choose a style that accentuates your hair, one that you can maintain. Then, let that be your crowning glory even when you are running to the grocery store. You have a small waist but are fuller through the hips. Choose styles that minimize your hips while accentuating your small waist. You get the picture. Focus on the features that bring you compliments, those features that you love about yourself and make the most of them. We love to help women recognize their own special beauty that others do not have. How fun to embrace your own “Signature Style” and be the most beautiful “you” that you can be! Author Beryl PleasantsPosted on September 26, 2017 Categories ImageLeave a comment on Look! I’m Beautiful! How Do You Choose the Best Hair Style? Have you ever taken a picture of a new hairstyle that you just love to your hairdresser asking to have the style copied for you? If you are like me, you have experienced having your hairdresser respond with all the reasons that particular style will not work for your hair. However, your hairdresser may not have considered other factors that can make or break a good hairstyle. When I met Rubina, she had been referred to me so she called to interview me before embarking on a closet edit. She dropped by my home early one morning, right after having gone to the gym, still wearing her gym clothes with her dark hair pulled back in a pony-tail. As we got to know each other, I asked if she could let her hair down. She promptly removed the rubber band and shook out this magnificent hair, framing her face with soft curls. Rubina transformed before my eyes from attractive to stunning! Several weeks later, after we had transformed her closet from the enemy to a friend with many choices at her fingertips, I asked if I could take pictures of her new image. She invited me to come to her upcoming hair appointment so her hair would be perfect. When I arrived toward the end of her appointment, I discovered that she had asked her hairdresser to give her a “straight” look. Gone were the curls that supported the lovely soft lines of her face. There was a complete disconnect between her rounded facial features and the straight lines of her hair. I took several picture but they simply did not do justice to Rubina so I did not use them. Recently I was going through my photo library and ran across these photos. Rubina was kind enough to give me permission to use these photos to illustrate how using the lines of your face are every bit as important in choosing a hair style as are the characteristics of your hair. This is Rubina showing off her unique beauty with which she has been designed. Author Beryl PleasantsPosted on September 20, 2017 Categories Image, Image Consultant, StyleLeave a comment on How Do You Choose the Best Hair Style? Polka dots and stripes are in abundance on the fashion scene. All polka dots and stripes are not created equal. Let’s look at them more closely and see which iteration might have a place in your spring wardrobe. Polka dots just shout “fun”. Their shape reminds you of balloons and balls. When I took classes at UCLA my professor said polka dots were frivolous. I have come to the conclusion that tiny polka dots with little space between are, indeed, frivolous while larger polka dots with more space between them have much more stability. These polka dots are still fun but become less frivolous. Stripes in women’s fashion are often horizontal, projecting a serene message. Think of a landscape with the many horizontal lines. Turn the stripes into a diagonal, and they project an active, dynamic image. Picture the contrast between the serene field and jagged mountains. Vertical stripes project an erect, soldier-like image. Men’s pinstripe suits have a formal, business persona. This diagonal stripe incorporates several different design features. This dress is not for the quiet, shy person. She must be dynamic! When stripes are used in women’s fashion, they can vary in width as well. The wider the stripe, the more impact it makes. I noticed the first stripes that appeared in the fashion cycle this year were in black and white. This contrast is dramatic to begin with so a very wide stripe in black and white can only be pulled off by a wearer with a lot of attitude. By softening the color palette, a wide stripe loses much of its drama. Today, I was looking at a new magazine picturing a soft pink and white, wide horizontal stripe. It was perfect for the blonde, feminine model. Black and white would have completely overpowered her. With polka dots, varied colors become more frivolous and whimsical. If your facial structure has lots of angles or your brows are straight, stripes will be excellent for you. If you face is soft with lots of rounded lines, polka dots will be your friend. If you have a combination of rounded and straight lines, you can wear either print. Have fun choosing the size and shape that best says YOU! Need some guidance in choosing the best stripes or polka dots for you? That’s what we are here for. Beryl@StyleWithAplomb.com or 404-428-2527. I like pink, Gamma! It’s my favite color! Beautiful soft pink. Add a jacket for the office for a more professional look. Be careful the soft color doesn’t wash you out. When my granddaughter, Juliet, was three or four, she and her older brother, Patrick were spending the day with me. Juliet somehow got on a kick about pink and proceeded to follow me all over the house repeating, “I like pink, Gamma. Pink is my favite color! Patick doesn’t like pink. He says it’s a gul’s color but I like pink!” She may have had an issue with pronouncing her “r’s” but she certainly knew her own mind. Pink is a big focus color this spring so don’t limit yourself to just thinking of pastel pink. There is a shade of pink for most any color palette. Even if you are warm toned with a peach skin undertone, you can sneak in some pink with a little orange added making a coral tone. Adding a note of cheer to the spring palette, pink projects femininity and warm sensitivity. I have found that most men who enjoy wearing pink are more thoughtful than the macho guys who look on pink with disdain. This is the man who brings you flowers and remembers cards for special occasions. My husband enjoys wearing pink and it looks great on him. Yes, he is the one who brings flowers and does thoughtful things. Pink is flattering to most skin tones and serves as an excellent accent for both office and social. It can be worn with gray, navy, white, and black as a base color. Certainly, one would not wear a light pink suit for an important business meeting but you could wear a beautiful blouse or scarf in pink as an accent. The myriad shades of pink each send their own message. A soft pastel pink is feminine and youthful but lacks power, whereas a deep raspberry pink projects a more powerful image while still projecting femininity. A muted shade of pink has some gray mixed with it. It is subtle and is especially lovely worn by a more mature lady. If you aren’t ready to fully embrace pink, try a scarf or some fun jewelry as an accent for something different. Enjoy! P.S. Juliet is now a junior in college and still likes pink. Patrick is finishing his masters and wears pink shirts. Both of them can now pronounce their “r’s” ! Author Beryl PleasantsPosted on February 15, 2017 September 22, 2017 Categories Beryl Pleasants, Color, Image, Image ConsultantLeave a comment on I like pink, Gamma! It’s my favite color! Are they wearing a uniform? I hear this phrase often from clients. Does this sound like you? It seems that more and more ladies are choosing athletic wear for their every day attire. Athletic wear is often called “activewear” and I have seen numerous articles promoting “activewear” as a staple for daytime casual wear. Activewear is excellent for exercise class but I don’t like to see it worn to the grocery store, running errands, taking the kids to practice or any of the myriad activities we all do every day. If you are wondering why I feel this way, let’s look at the image it projects. The first thing that jumps out is these ladies are not showing their personal style. Look at these two ladies in the first picture. Although they do not to appear to be together, they appear to be wearing a uniform. Unless you work for a car rental company or fast food restaurant, most people are not excited about wearing a uniform. Then there is the issue that not all ladies look their best in activewear. Athletic clothing is usually loose and baggy or it fits the body like a second skin. Neither look is becoming to the majority of ladies. I frequently see ladies who are quite full through the hips, wearing thin stretch tights to places other than the gym. One always holds their breath for fear of a seam bursting open! A jeans jacket is always good with casual. Option of a longer look for more coverage. What if you could choose something “comfortable” that is flattering to your build, reflects your personal style, and draws compliments? Let’s look at some possible options to help achieve this. If you prefer wearing athletic wear, how about pairing the tights with a regular top? There are exercise pants that fit tightly or have straight legs. Choose the style that is the most flattering for your build and select a top that comes down over the hip line to avoid being too revealing. The addition of simple jewelry or a scarf can go a long way to give a charming casual look and not look like you just came from your yoga class. Adding a casual jacket will complete a finished look and add the warmth you need for cooler days. Great longer stylish top. Could wear with tights or jeans and flats. Jeans are another great option to being comfortable yet attractive and practical. There are so many different cuts that most women can find a style that fits nicely. The most wearable will be a dark wash without distressing. 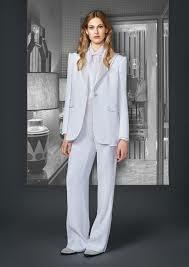 Complete the look with an attractive top or even a white blouse and add a jacket for a more polished appearance. There are many options to finding something comfortable. Remember, the more you look like the person you are deep down inside, the more comfortable you will be! Author Beryl PleasantsPosted on February 7, 2017 February 7, 2017 Categories Beryl Pleasants, Image, Image Consultant, Style, WardrobeLeave a comment on But It’s So Comfortable!